When dryers are vented properly, they save money by running more efficiently and help prevent fires. To ship more efficiently, all Dryer-Ells are built to nest and assemble with a quick twist and snap. It is important to tape both the connection joint and the seams where the two sections of each Dryer-Ell assemble. You may find links to full install instructions for each model below. Bend all connection tabs almost straight up before twisting the two sides together to ensure a snug fit. Then flatten them to secure the sides. 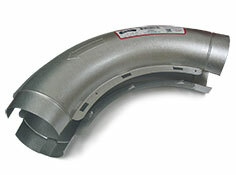 Always tape the seams between the two sides as well as the ends where the Dryer-Ell connects to straight pipe. For run-length restrictions follow either the manufacturer's guidelines or the table of equivalent lengths for elbows: do not mix and match the two. You can help: If you have ideas or suggestions to help us improve and promote proper venting, please do contact us via e-mail with your thoughts. With your help this section will grow and continue to provide new ideas for dryer venting safety.